The Scythes of the Tenax build up to their first mission. 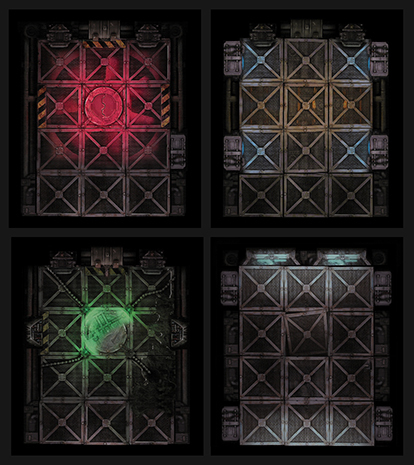 I’ve begun remixing Space Hulk artwork to create the spaces within the transports and cargo ships of the convoy. A small randomisation table will be drafted for the type of spaces they enter and the foes they’ll encounter. For some, you’ll notice a similarlity to Warhammer Quest; a format which suits this sort of explorative close combat type of game. Should be interesting and down right deadly. Here are the first large rooms that will make up Cargo sections. I have to create engineering, atmospherics and crew quarters as other potential areas. Brilliant! Love it! I can hardly wait to see what you’ll do with this. Cheers Modhail, basically a 2D version of your hulk board scenery :D Interesting trick will be making a game that is tense, but won’t wipe out what few Scythes I have! Haha. These look really nice, Seb. You going to make them available for download when finished? Thank Nick :) Download? OF course :D Just filling out the collection.